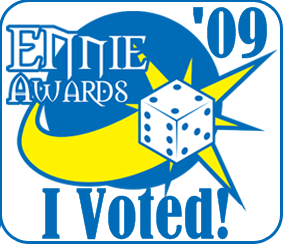 The 'Ennie Awards' nominees have been announced. Normally I have very little interest in the Ennies, since they typically focus on games that I do not play and have zero interest in. Much to my surprise, however, this year Swords & Wizardry has been nominated as the best "free product." Moreover, 'old school' companies Mythmere Games and Goblinoid Games have been nominated in the 'Best Publisher' category!